In a Meeting Room just down the corridor from the Mayor of Liverpool’s Offices in The Cunard Building situated on the World famous Mersey River, the 2018 LIMF Academy cohort was the latest stop on Back 2 Da Future Music’s 10th Anniversary Workshop Tour. The LIMF Academy is an award-winning talent development programme that gives Merseyside’s most promising emerging talent the opportunity to grow and develop their craft as artists or bands. 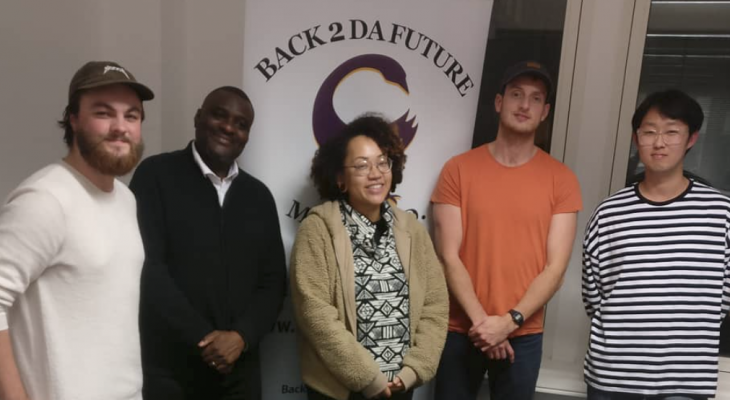 As part of their mentoring sessions with Industry professional and LIMF Coordinator Yaw Owusu, Back 2 Da Future was invited to speak to the young people who included Band members, Songwriters and musicians. “It Was Great fun, I wish I hadn’t been late”, seconded one artist/Teacher. Kickstarted in Accra, Ghana earlier in 2018, the 10thAnniversary seminar tour had seen Kennedy Speak during the Summer, at The London and City Universities respectively, as part of International Reggae Day and a further Reggae Copyright Breakout Session. Autumn saw him at the Pempeople Pop up space in Peckham in South East London. “It was coming up to our tenth Anniversary and we wanted to mark the milestone.” Glowed the 20 year Publishing veteran. “We knocked around a couple of ideas like throwing a party, doing a sampler or putting on a showcase and settled on spreading the ‘KNOW-ledge’ through a series of workshops throughout the year. We started in Ghana during Independence week and continued back here in London over the Summer. We shall be in Jamaica in November for a couple of events around the Jamaica Music Conference at UWI (the University Of The West Indies)”. LIMF Academy is open to all musicians from any genre. As long as you’re aged between 16-25, have recorded music for us to hear and live in Merseyside, you can enter. We’ll be looking for our next intake in Spring 2019, so keep in touch by signing up to our e-newsletter and following us on Twitter, Facebook and our Tumblr page.